The trial stemming from the 2010 kidnapping and murder of 15-year-old Dystiny Myers is officially under way, with prosecutors alleging that the defendants committed the crimes to protect their methamphetamine ring, and defense attorneys laying blame for the murder on co-defendants who already accepted plea deals. 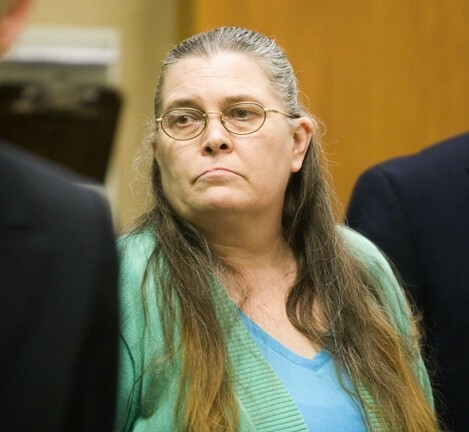 LONG OVERDUE : Jurors listened to opening statements in the criminal trial of a mother and son accused in the September 2010 murder of 15-year-old Santa Maria teen Dystiny Myers. Pictured top is prosecutor Tim Covello, center is defendant Rhonda Wisto, and bottom is Sheriff’s Detective David Walker displaying a .38 caliber revolver found in a vehicle during Ty Hill’s arrest. 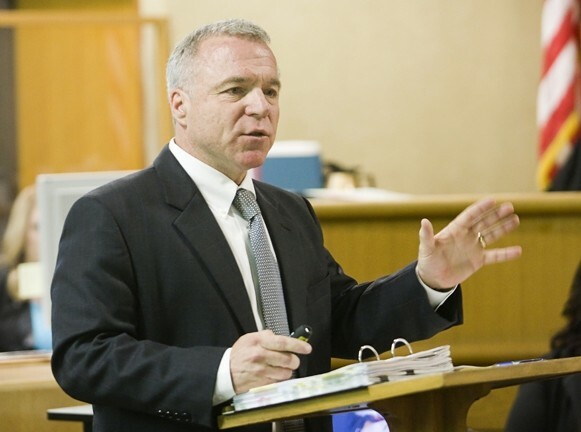 Despite efforts by the prosecution, testimony at times turned gruesome and tense, and Chief Deputy District Attorney Tim Covello apologized to jurors ahead of time for having to show photos of the charred hole where the young victim’s remains were discovered. Attorneys for Rhonda Wisto—the alleged ringleader—and Frank Jacob York, Wisto’s son, both rejected arguments that their clients conspired and carried out the brutal murder, and challenged the motives of two former defendants who’ve agreed to plead guilty and are expected to testify for the prosecution. During opening statements on March 11, Covello characterized Wisto as the mastermind in a “budding criminal enterprise” that included “the ultimate facilitator,” former defendant Ty Michael Hill—the sole individual who faced the death penalty—who entered a guilty plea on Jan. 3 in exchange for a sentence of life in prison without the possibility of parole. Covello said the mother and son were associated with street gangs and operated a safe house where methamphetamine was sold and consumed. He suggested Wisto ordered York and his friends to carry out Myers’ murder because Myers knew too much about the group’s dealings and was disrespectful to Wisto. Gerald Carrasco, defense for York, told jurors that York spent most of his time at his girlfriend’s house and wasn’t home when the others plotted to kill Myers. There’s no shortage of physical evidence linking the group to Myers’ murder, much of it located at Wisto’s Nipomo residence. Following initial arguments, witnesses began pouring in for the prosecution, namely first responders to Parkhill Road in rural Santa Margarita. 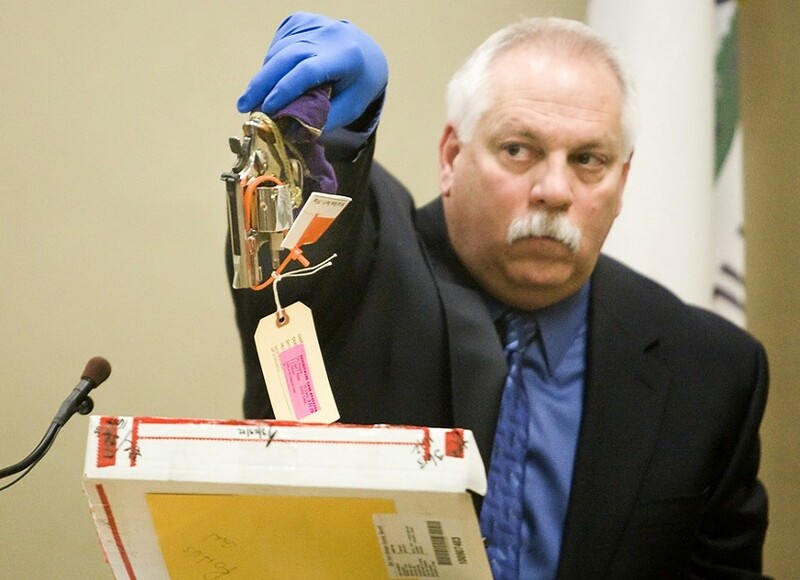 Among them was Ken Jones, a forensic specialist with the SLO Sheriff’s Department, who later examined Wisto’s truck, discovering a bag containing a knife sharpener, brass knuckles, and a box of gloves. Jones testified he also identified two fingerprints on a bloody baseball bat as belonging to York, though he said investigators contracted out the testing of blood discovered on three shovels and in the bed of the truck. The results of those tests have yet to be revealed. The defense chose not to cross-examine many of the expert witnesses. The most horrific testimony came from retired deputy Stephen Crawford. Heads shook, eyes were averted, and Myers’ mother had to rush out of the courtroom as jurors were shown graphic slides of Myers’ burned body on the autopsy table. Crawford testified how Myers was bound, a sweatshirt and rope wrapped tightly around her neck and ankles, and a glove shoved in her mouth. According to Crawford, the determined cause of death was mechanical asphyxiation, which was exacerbated by blunt force trauma and methamphetamine intoxication. A number of times after jurors exited the courtroom, both defendants were seen smiling and joking with their attorneys. On the second day of testimony, the court heard from a number of associates of Wisto and York, including two currently in custody on unrelated charges, and some of which contradicted their earlier statements to investigators about the group’s drug activities, according to the prosecution. Witness Dwayne Bourgeois admitted to the jury that he acquired drugs at Wisto’s house and described how he and friends in the Galaxy Mobile Home Park in Nipomo “watched each other’s back” and tried to “keep each other out of trouble” when police were spotted in the neighborhood. “I never thought anything of this magnitude would happen,” Bourgeois said. Another reluctant witness, Daniel Morin, unsuccessfully tried to seek protection under the Fifth Amendment. The trial is expected to last another two weeks and include testimony from co-defendants Cody Lane Miller, 22—who pleaded guilty Jan. 7, is scheduled for sentencing May 15, and is facing 39 years and four months to life—and Jason Greenwell, 22, who has yet to enter a plea or receive a sentence pending his cooperation as a witness for the prosecution.